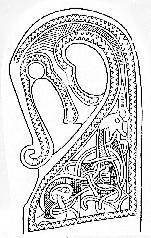 The discovery, at the end of the C19th, of several Viking longships, with their treasure intact, an increase in the old styles in design circles and rising nationalism led to a Viking style revival, called the 'Dragon' style, across Scandinavia. The style left it's mark on everything from illustrations up to new houses and hotels. It echoed the Celtic revival here in the UK by designers like Archibald Knox, CR Ashbee and Liberty. The bed is a copy of a C10th Viking original, discovered in the Gokstad longship burial, on the banks of the Oslo Fjord. Only important Vikings were buried with their ships, and all their personal possessions went with them. This particular burial had a huge array of personal furnishings, preserved in remarkably good condition. 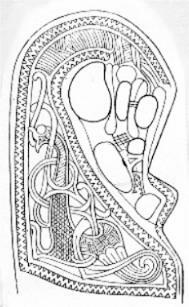 Hence, this allowed us to make good reconstructions of the original pieces. The bed was originally made in the C10th, and it is very close in style and design to the prows on contemporary longships. It is incredible to think they lived on a daily basis with such stunning designs all around them. Imagine the effect of such a bed in the atmospheric light of a candlelit interior. 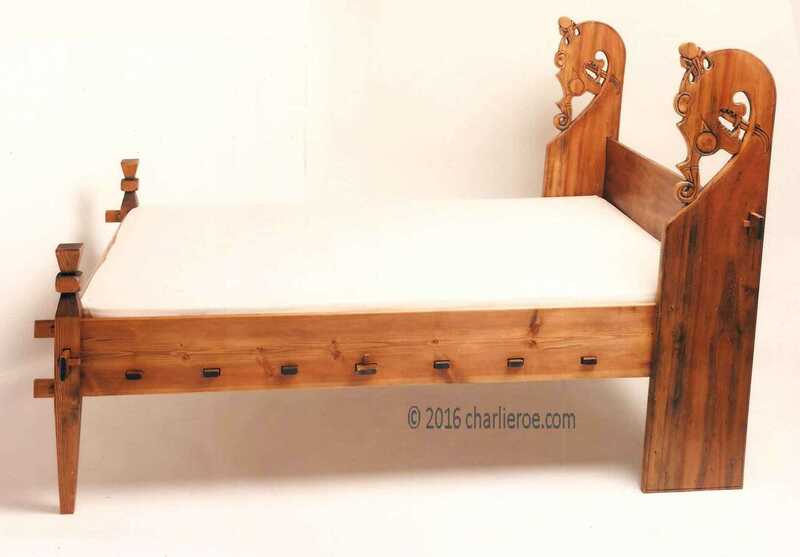 The bed itself shows great skill in it's construction, showing the Vikings advanced technological skill using wood. The constuction, using wedged mortice and tenon joints, was very advanced. This also had a practical advantage in that the wedges could be knocked out and the bed disassembled in minutes ( a definate advantage in Viking times ). 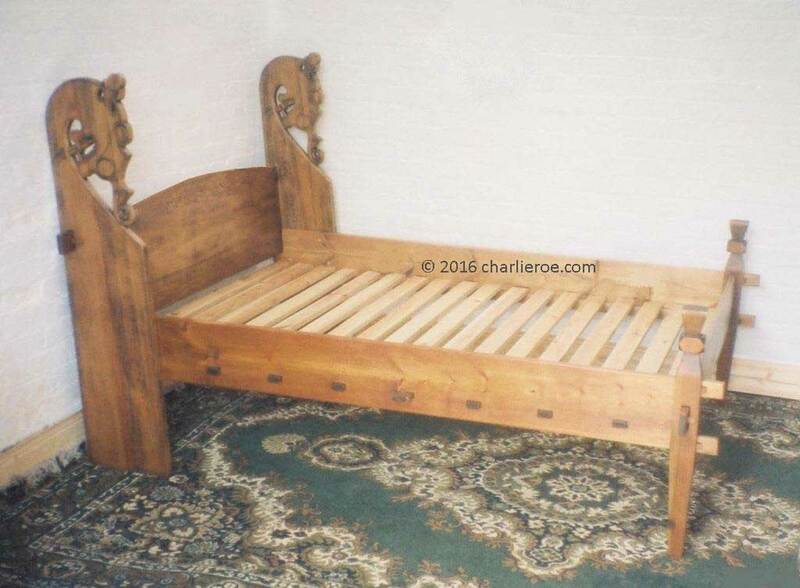 The original bed was probably about 4ft 6" long, as the Vikings slept in a semi sitting up position ( this bed size and practice continued in Norway for many centuries after the Viking period. These original beds usually had straw filled mattresses. The bed can be supplied as a single, double or king size, with a slatted base. It has shallow relief carving on the 'Dragons' and is finished a dark brown. The headboard could be straight or curved (as photo below). For all it's drama, there is an almost modern 'clean lines' look about it. Made to order. We don't give out sizes until we've agreed a specification with a client. 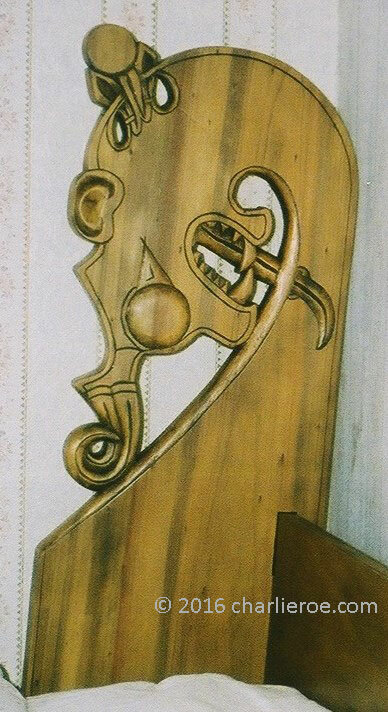 The carved 'dragons' are close in design to contemporary longship prows, and make a striking profile. We can supply different designs for the Dragons, see a couple below, some being even more fierce looking ! The bed can be supplied as a single, double or king size. A complimentary range of furniture in style is being researched at the moment and will be added to complete the bedroom suite.